STEM stands for science, technology, engineering, and mathematics and represents areas where Oklahoma doesn’t have enough skilled workers to meet the demand across the state causing a skills gap. There are approximately 6,000 STEM job openings a year in Oklahoma, and even though there are approximately 6,000 graduates a year, almost half leave the state or take a job outside the studied field, according to the Oklahoma STEM Foundation. The Oklahoma STEM Foundation website states that in 10 years, Oklahoma is expected to have to replace 40% of the existing STEM workforce. That’s a lot of jobs to fill, and Oklahoma is trying to ensure all students have access to STEM education opportunities. Central Tech’s Biomedical Sciences and Pre-Engineering classes are preparing students to further their education in the STEM fields after high school. They utilize Project Lead the Way curriculum, nationally recognized for hands-on projects and experiences. In Biomedical Sciences, it’s CSI meets ER. 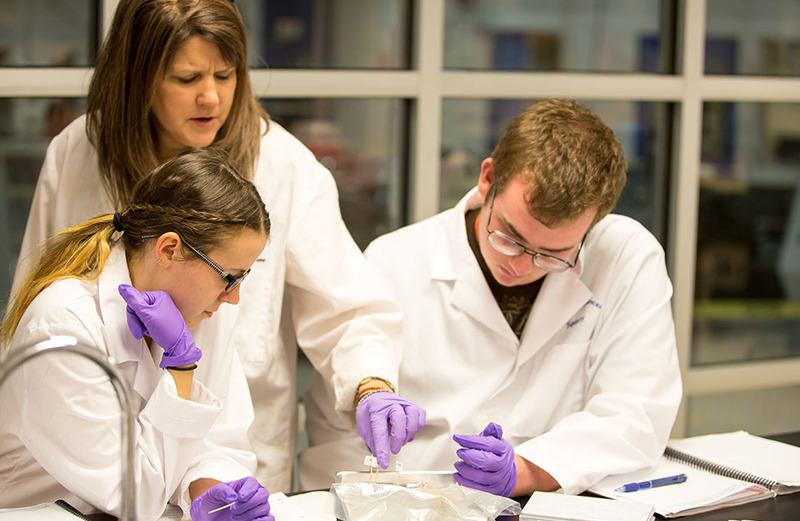 Students are able to solve a forensic mystery, learn to read a genetic map, and isolate DNA from cells. It’s engaging. It’s cutting edge. The students use the latest equipment and information to solve real-world biomedical challenges, preparing them to go on to college. Biomed students build a foundation for future learning and career opportunities. “Central Tech has been extremely beneficial. I took the Biomedical Sciences class and now I’m studying bio-chemistry and molecular biology at OSU. I’ve worked in research labs and the professors have said, ‘Wow, you already know this,’ and I learned it in Biomed,” says Mariah Burris former Biomed student. Pre-Engineering at Central Tech combines math and science with engineering-related classes to provide students with the academic preparation and understanding of engineering to better determine their interest in pursuing engineering as a career. As a requisite of the Project Lead the Way curriculum, students attend with the plan to obtain a college degree in an engineering discipline. Pre-Engineering students are able to take their natural curiosity and design their own projects using industry-leading 3D software. They use digital logic to build and program robots, build a rocket and launch it with a video camera attached, and take honors level math and sciences courses applying them to engineering concepts, essentially creating their own future. At Central Tech’s Open House in Drumright, come try your hand at operating a robot or take off on the flight simulator. Open House is Sunday, February 19, from 1 p.m. to 4 p.m. on both the Drumright and Sapulpa campuses. For more information, visit CentralTech.Edu. Pre-engineering student works on a robot getting it ready for competition.